Hey Everyone, I finished my book Monday night. Yesterday, I read over the entire thing and made edits and tweaked it. I am happy with it and I sent it to my writing friends earlier today (you know, the ones I get together with weekly). Now I’ll wait for their feedback, then I’ll do more editing. Then I’ll be looking for some good Beta Readers. Just an FYI, I didn’t write this entire book in one month for NaNoWriMo. 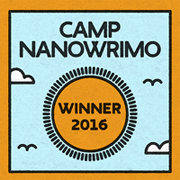 I have still not participated in NaNoWriMo, but hope to next year. I’ve been working on my story since April. The genre is Contemporary Christian Romance, so if you read A LOT of that genre or if you write that genre and have time to read my 40,000 word manuscript, you may get the opportunity to do so soon. In my next couple of posts, I’ll do my best to whet your appetite with a little bit of information on my main characters and a tad bit about the storyline. If you’ve been a Beta Reader before of have used some good ones you think would be interested, please leave a comment giving me the details. Thanks!